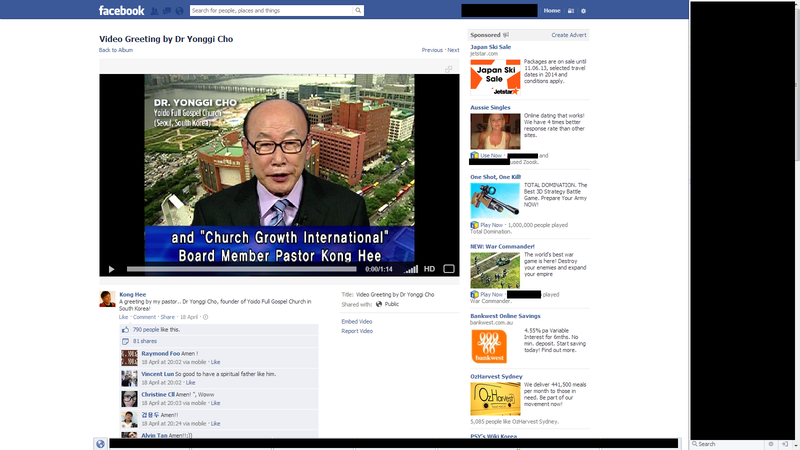 WHO IS ‘PASTOR’ KONG HEE ACCOUNTABLE TO? ‘Pastor’ David Yonggi Cho is internationally recognised of having the worlds largest church. Yonggi Cho is Kong Hee’s pastor? Is this who Kong Hee is accountable too? If he is, then CHC members should be concerned. WHO IS ‘PASTOR’ YONGGI CHO ACCOUNTABLE TO? It is important you read these previous articles before reading the latest news. The first article reveals how Yonggi Cho seemed to lack any accountability to his elders. The question has to be asked, who is David Yonggi Cho accountable to in his church? Is this why we are seeing scandals break out in Phil Pringle’s C3 Church Movement and Kong Hee’s CHC leadership? Who are Kong Hee and Phil Pringle accountable to? SEOUL, June 9 (Yonhap) — A noted pastor has been indicted on charges of breach of duty and tax evasion, prosecutors said Saturday. Cho Yong-gi, the founder and pastor emeritus of Yoido Full Gospel Church in Seoul, is suspected of causing 15.7 billion won (US$14 million) worth of losses to the church by instructing church officials to buy stocks privately owned by his eldest son Hee-jun at prices four times higher than market value in 2002, they said. 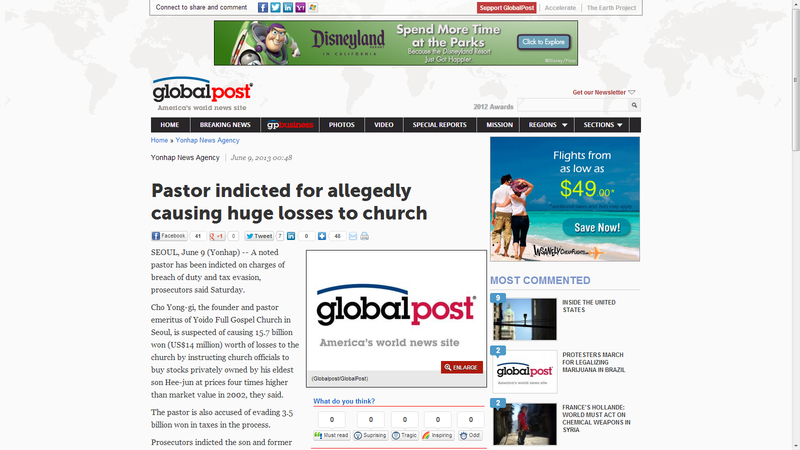 The pastor is also accused of evading 3.5 billion won in taxes in the process. Prosecutors indicted the son and former chairman of the daily newspaper Kookmin Ilbo on embezzlement charges in December. After investigating him, prosecutors said the pastor is an accomplice in the alleged crime. The foundations of God’s throne is righteousness and justice. Let the guilty be punished and the innocent vindicated. Phil Pringle is also supposedly accountable to Cho, and, of course, is also a close friend, confidante and mentor of the now thoroughly-disgraced Hong. With Cho having been indicted, and with Hong being in the middle of a court case with several of his sticky-fingered cronies on charges of falsification of accounts and criminal betrayal of trust, it appears that the waters both upstream and downstream of Phil have been well and truly polluted by the sin of greed and the lust for money. Pringle continues to insist that he preaches the true Gospel, not a perverted prosperity version based on mangled scriptures and vain imaginings. However, with both Cho and Kong now well and truly under the microscope, it appears that Pringle is under a great deal of pressure. He is doing his best to manage the situation by drip feeding information to his hapless congregants, who remain largely ignorant of the true facts regarding Kong’s case (many believe that Kong is being “persecuted”, and they accordingly view him as a martyr for the cause). Truth is a wonderful thing – unless, of course, one happens to be on the wrong end of it, as Phil Pringle is. Amen… judgment begins in the house of God. He loves us enough to chastise us but we must maintain a “there but for the grace of God go we”. It is tricky indeed when we confuse who is the head of the church. We malign the Roman Catholics for Papal authority yet we have many popes in the protestant church. When great fortune is involved, God help us. When Paul had to correct Peter I’m sure it was rather uncomfortable, but it had to be done. The Spirit filled church must repent of this obsession with the almighty doller. True repentence will bring a new move of the Spirit because God draws close to a broken and contrite heart. Sin always crouches at the door– seeking who it may devour in every hour . that makes a fallen one– another casualty. It is in times of intense trial where you find out who your true friends are. It is so easy to judge, but we all know what Jesus said about casting the first stone. Whatever happens, let’s just pray that the purpose why God allowed this to happen will be fulfilled. Nevertheless, accountability is important to avoid incidents like this and to protect one’s self. Let us refrain from acting like Job’s friends, instead, let’s intercede for Pst. David Jonggi Cho, after all, he has accomplished much in his country. We as the church need to pray for our leaders. Dr. Yonggi Cho has done so much for the LORD. He is human and they could be lots of people with ill motives around. Even the Lord Jesus had one among twelve. Let us pray for the church. The gates of hell shall not prevail! Amen. Christians are never instructed to pray for wolves, hirelings and false teachers. That is unless we pray for them to repent and be saved. Jesus calls false teachers “wolves in sheeps clothing” “lawless ones” and condemns their good works. Christians have failed to biblically discern the wolf Yonggi Cho. God has used our civil laws to expose that David Yonggi Cho is a false teacher/ man of lawlessness, just as Jesus said. We cannot call a man who teaches Christians to practice the occult our brother in Jesus. To do so would be a sin. you who are without sin, cast the first stone. Do you believe that Christians should seek to please God before man? James 5:19 Brethren, if anyone* among you wanders from the truth, and someone turns him back, 20 let him know that he who turns a sinner from the error of his way will save a soul from death and cover a multitude of sins. *no small print, exceptions, or loopholes there…. The church need to Pray for Dr Cho. A man of that kind need everyone’s prayer. I pray that the same encounter Peter had in the prison, Dr. cho will receive the same in Jesus name. The gates of hell shall not prevail against the church, in Jesus precious name. “Dr Cho is really innocent. His son Ch Hee-Jun who has multiple convictions previously and been jailed twice, is the real culprit. The son shifted the blame to Dr Cho in court. If Dr. Cho had pointed his finger at his son, the son’s sentence would have been tripled. So Dr Cho accepted the false blame so that the son could have a lighter sentence. He did this in spite of his church elders begging him not to do so; but Dr Cho said that “I will never betray my own son, even if has blamed me for this”. Most people in Korea know Dr Cho is really innocent in this. At the sentencing the judge recognized that his son was the real culprit but Dr Cho was given a “Suspended” sentence, which in Korea means a sentence that he would never have to serve. I understand why a parent will accept the blame and save his son. Parents often favour their children and it is not uncommon to give them leadership jobs in the family business, despite their failings or lack of ability. However, Yonggi Cho’s responsibilities should have been first to God and church matters. He should have been aware of conflict of interest. You can’t have it both ways. At best, Yonggi Cho showed a lack of wisdom, lack of integrity, lack of discernment and lack of due diligence in performing his duties. No-one has a problem of people failing. Repent, tell the truth, maybe step down and get your life back on track. You can’t cry I am a victim on one hand (and hence not fit for the job) and yet insist on being the right man for the job as leader (and not listen to his elders who warned him). Cho cannot claim ignorance as he was warned. Since when have leaders not needed to be responsible or accountable? Or is that just in his church? Being the powerful and influential leader who can disregard elders, have them expelled or suspended, keep his family in key positions and disregard advice, has come at a high price. Cho’s son, Cho Hee-Jun, has had “multiple convictions and been jailed twice” – so why was he put in such a leadership position where he had control and influence over people and had access to so much money and more importantly, influence over his father (a weakness of Cho’s?). Firstly it was not right for the organization and secondly it was not right for his son as the temptation was there. Cho’s elders warned him. Was it the advice of the accountants to blame for this as well? The court did not think so. Was Cho fit for the job or a victim? When you say “most people in Korea know Dr Cho is really innocent”, I have to ask how? I don’t think the 29 elders who asked him not to sign the papers think he is innocent. They were in a position to know the internal workings of the organization. The court didn’t think Yonggi Cho was innocent. “Most people” would only “know” what they have been told or listened to. So what have people been told? Not the truth nor the whole story. Did Cho’s decision to “never betray his own son” stop the truth from coming out? I totally understand why a parent would do that. But is that blind love or true love? And again truth is the victim. The best people from outside the church have is to put the jigsaw puzzle pieces together while the church goes into damage control mode (nothing is transparent). 29 elders paid a big price for doing their job. Cho dismissed the allegations from elders as “a smear campaign by an opposing faction of an extremely few people” in his church. “The truth will reveal itself during the prosecutors’ investigation. Those who filed the complaint will have to take responsibility accordingly,” he said in a statement. Well the courts did decide. Does Cho owe the elders an apology? Will they be reinstated? I bet not because the culture of the church is to be behind the leader no matter what. Truth is not important. Maybe Yonggi Cho needs to take responsibility and have church dealings transparent. The Book of Proverb says spare the rod and spoil the child! It’s a moment of darkness but later or sooner the truth of light will shine. God be with him. The charismatic churches always preach about money, and ask for 10% of salary from baptised members! How could Sun Ho be a pastor when she is not theologically trained? How could I say amen when I don’t understand what the tongues means? I grieved when I researched the claims against Mr. Cho, as I have read his book (written some 20 years ago) on prayer and his love for God and God’s ways. He spends more time praying than any man I’ve ever heard of and even testifies to the fact that he is just a man and can fall and would be targeted for a great fall, for no other reason than the work of God that has been done through him by God. He knows he is a great enemy of satan and that he is a man inspired and driven by the Spirit of God. He is also very aware that sin blocks his relationship with God……and so it appears to have. In my time with the Lord, He has shown me that ‘Justice is Mercy,’ and this is the very characteristic and name of God. Mercy, like all of God’s gifts to fallible man is for the sake of Salvation, the very Son of God. I am convinced God is with Brother Cho, and will continue to be with him in spite of his behavior and the accusations brought against him. God loves this man and seeks and desires for him to be one with Him. God’s will be done. This man prayed for so many millions over the years. He organized and set up over 80,000 cell groups for the sake of prayer and ministry of the name of Jesus Christ in a place where Satan breaths down their necks. May he turn fully to God and use this occasion for the glory of God and the Salvation of souls. We as believers must continually be in insistent prayer for the South Korean Church. They are us….the body of Christ……and they are under full attack for the destruction of the Church by satan himself. Scripture please. Personal enlightenment is fine, but it must align with scripture. There are a lot of people preaching “mercy” because they like the sound of it, but miss the fact that Jesus spoke more about judgment. We need to obey what Jesus taught. This is fundamental.